The global market for investments in mines is on the upswing according to Emerson’s Juan Carlos Bravo, a member of the Mining industry team. As we reported last year, despite the deceleration of the Chinese economy we still see that mining investment in copper and Latin America continues to be strong. 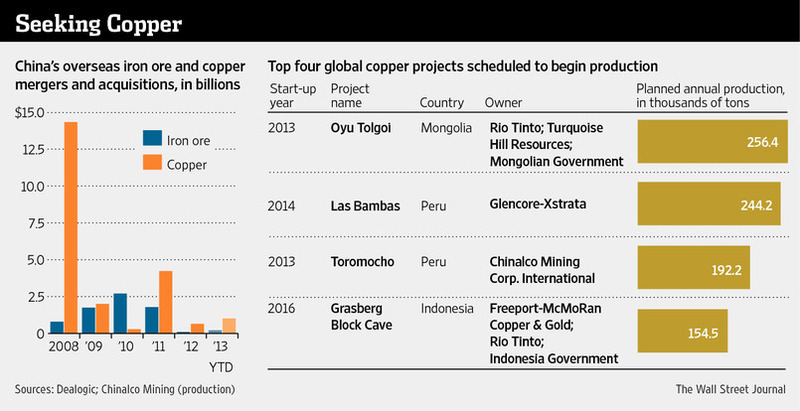 Proof of this is what was reported in the September 2 Wall Street Journal article, China Vies for Peruvian Copper. Even as copper prices have fallen, China’s hunger for additional supplies of the metal shows no signs of abating—three units of state-owned resources giants vie for a huge copper asset in Peru. The State-backed Chinese miner, Chinalco Mining Corp. International, MMG Ltd., and Jiangxi Copper Co. are considering bidding for Glencore Xstrata PLC’s Las Bambas copper mine in Peru, which is scheduled to produce 400,000 metric tons of copper annually beginning in 2015. This transaction could be worth $5 billion, and if successful, the deal would be China’s biggest overseas copper-mining acquisition. The only other comparable copper mine co-owned by China will be the $6.2 billion copper-gold Oyu Tolgoi project that is 66%-owned by Canada-headquartered Turquoise Hill Resources Ltd. But according to Chinalco Mining, Las Bambas is a close second in terms of output. China, which imports about 3.4 million tons of refined copper per year, consumes more than 30% of global copper production. Like the country’s oil and gas companies, Chinese miners are increasingly heading overseas to secure resources. So far this year, Chinese companies have spent $1 billion on foreign copper-mining deals, eclipsing the $653 million they spent in 2012. These may prove to be wise investment moves for the Chinese companies, buying while the price of copper still low and calculating that the long-term demand of copper will push prices up again. This is something that is already happening with copper prices going up 4.5% in August driven by good manufacturing numbers from China and by surprisingly strong industrial activity in the Euro zone and continued recovery in the U.S. I believe this acquisition of mining assets trend by Chinese companies will only accelerate, not just in Latin America, but also throughout the world. Also, Chinese companies will have to adapt to the new challenges in the regions they are entering and specifically to the ones in Peru. Las Bambas is located in one of the most isolated and mountainous regions in the south of Peru where problems with communities exist due the water and environmental restrictions. Also, mining suppliers will need to adapt to this new landscape as well in negotiating technology purchases by the Chinese companies. These suppliers will need to ensure that their products and services add value to the production chain and help overcome the challenges in the region. These challenges include effective water management, remote operation and environmental compliance. All of this is good news for miners, demonstrating that the industry is globalizing further and that the economic trends remain positive regardless of the source of the capital investments. Posted Monday, September 9th, 2013 under Metals, Mining, Minerals.